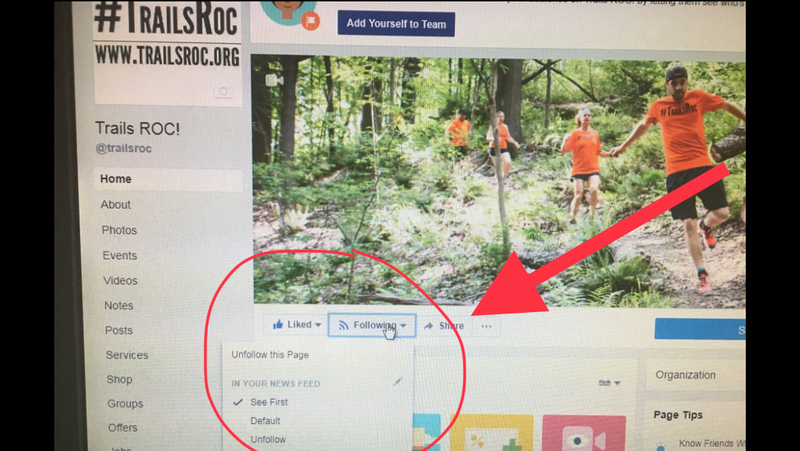 Facebook has changed the way you see posts from a page. As a 501c3 Not For Profit, we are not in the position to pay them for you to see what is going on so we likely will not be in your news feed. You can however be sure to get our posts in your feed by simply opening our page – clicking “following” – and then checking “see first” We have attached a screen capture with some fancy circles and arrows to help you out. In short – If you want news from us, you might want to do this. In other news in case you missed it (Thanks, Facebook) – We have a few fun events planned this spring. March 3rd – It’s our birthday!!! Come join us for a 9am group run celebrating 6 years of trail love! We will meet at the Beach Lot (Mendon Ponds Park) for a 1 hour run and then have a potluck breakfast party in the pavilion, bring a dish to pass. Board member and tech guy McBeth reports the 6th celebration is the year of candy, and we won’t complain if that is what you bring! 10:30am Trail work – It’s our chance to give back! Afternoon of trail work as needed/motivated to get on with.